After the first time you visit this beautiful place, you’ll want to spend it in a few days, so that you have enough time to study it and fully enjoy your leisure. Once again, out of respect for tradition and authenticity, in 2008 Château Vartely opened a tourist complex, located just 45 kilometers from Chisinau. The tourist complex has a distinctive architecture and is a truly spectacular scenery. Three gorgeous tourist villas that were built following the regional traditions of the Northern, Central and Southern parts of Moldova can accommodate 40 guests. Guests of various events, held in the Complex, whose loyalty is priceless for us, are rewarded with reasonable prices and attractive discounts. Here, you will find a magical and relaxing atmosphere, full of traditional elements and spectacular views. Details are important, so the success that we have achieved, was achieved through the impeccable service, our attitude towards our guests, as well as the professionalism and enthusiasm of Château team. Our qualified staff will provide any information you need. Accommodation offer in our villa includes a range of additional services, such as the technically equipped conference room for your special events, and a terrace with exceptional views for a grand party. Tourist villas that were built following the regional traditions of the Northern, Central and Southern parts of Moldova can accommodate guests into 8 standard rooms, 4 VIP apartments and 2 rooms on the upper floors. All were designed to offer the joy of relaxing and comfortable atmosphere. If desired, the guests can use optional facilities such as sauna, billiards, dice, fireplace, and a safe playground for children. Each of them has two rooms, a bedroom and a living room. Breakfast is included. Guests staying in the VIP-apartments, get a 100% discount on the use of wooden pergola and barbecue with their prior booking. has 4 rooms Double/Single with two single beds and a loft with 2 single/double rooms with a double bed. Price – 50 to 80 euro/room. Breakfast is included. Guests staying in Single/Double Standard rooms, get a 50% discount on the use of wooden pergola and barbecue with their prior booking. has 4 single/double rooms with a double bed. Price – 60 to 80 euro/room. 1. What is the total number of people that can be accommodated in Château Vartely villas ? Our villas can accommodate up to 40 people. 2. What are your check-in and check-out hours? Please note that check-in is at 13:00. However, we can take your luggage for storage, if you arrive before this time. Check-out time is 11:00-12:00, which allows prepare our rooms for the guests’ arrival. However, this does not mean that you should immediately leave the territory of the complex. You can spend the remaining time in public areas of the hotel. You can leave your luggage for storage at the front desk until the departure. 3. How can I book a villa? You can book rooms by phone, e-mail or online on Chateau Vartely page on booking.com. 4. What is the minimum and maximum length of stay? Minimum length of stay is one night at the hotel, and the maximum is limitless. 5. If I cancel the order, will I have to pay anything? In the event of cancellation three days prior to the date of check-in, you will be charged a penalty of 100% of the cost for first night for each room booked. 6. 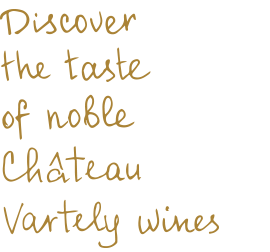 Is there an ATM on site or near the winery Château Vartely? Yes, there is an ATM in the territory of Château Vartely. 7. How can I pay for my villa reservation? Payment is made in lei, at the NBM exchange rate on the payment date. We accept cash, bank transfer or credit card payment. 8. Can I accommodate at the hotel with a pet? We love pets, but we have to inform you that they are not allowed in our hotel.